It takes real-life strategies to recognize harmful ideals about beauty and health and then reject them while developing body image resilience throughout the process. 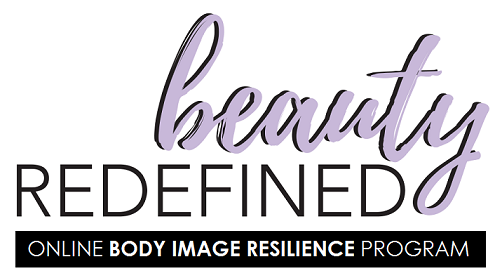 The Beauty Redefined Body Image Resilience Program is an online course for individuals that uses text, images, video, in-program journaling, challenges and online group discussion while allowing participants to track their own personal progress. It guides girls and women, ages 14+, through the life-changing process of developing positive body image and body image resilience in manageable steps. You can use this program at your own pace, on your own timetable, since all of the content is open and available to you once you purchase your membership. This 8-unit online program was developed and tested in our dissertations at the University of Utah and has been continuously updated and upgraded since then. It guides girls and women through the process of recognizing harmful messages in media and culture about female bodies; reflecting on the ways those ideals have impacted their lives; redefining the ways they think about beauty, health and worth; and actively developing body image resilience through four sources of power. Find out more about this program and register here. Speaking Events: We (the founders and co-directors of Beauty Redefined, Lindsay Kite, Ph.D., and Lexie Kite, Ph.D.) travel to offer their inspiring one-hour visual presentation across the U.S. For more information on booking us for your group, go here. For a list of our past and upcoming events, go here. We recommend starting with Step 1 and tackling each topic that may be relevant for you or those you love all the way through Step 3! We actively share our research in visually appealing and easily readable and shareable formats on social media, so please follow on Facebook, Instagram and Twitter for easy ways to see and share our research and resources on a daily basis. You can also find a gallery of our shareable quote graphics here.